West 10th Dental provides dental crowns in NYC. Call 212-982-5883 to learn more and schedule your appointment. A filling is the best option for tooth decay that is mild to moderate, but it is not sufficient for an extensively damaged tooth. Instead, a dental crown may be the best option. Dental crowns are a highly aesthetic and functional solution that blends well with the natural teeth while allowing you to bite and chew as normal. A crown protects the remaining healthy tooth structure, stabilizes the adjacent teeth, and helps to keep the jawbone strong. A dental crown takes two appointments to complete. First, we will take impressions of your teeth and the way they come together (known as the bite). This ensures that your new crown will fit properly with the rest of your teeth. We will then remove the damaged and decayed parts of your tooth and prepare it to receive the crown. We will take impressions of the prepared tooth, and then place a temporary crown for you to wear while the dental lab custom crafts your permanent crown. When your new crown is ready, you will return to our office. 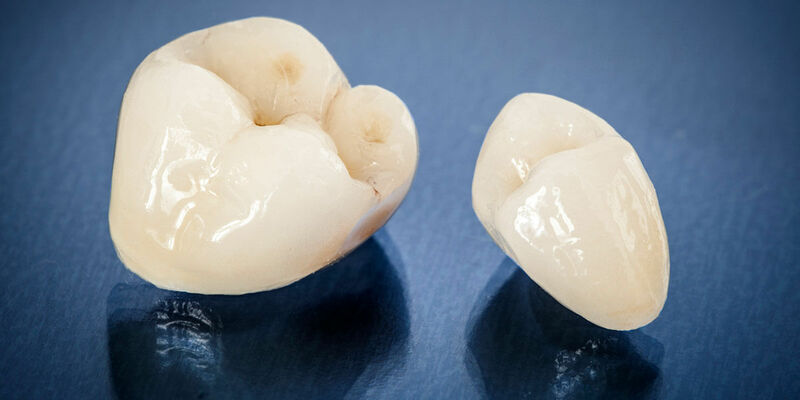 We will place the permanent crown on your tooth and bond it chemically. With proper care, a dental crown can last for decades. Dental crowns come in three basic types, each with its own pros and cons. We will review your needs, desires, and budget to help you choose the type that is right for you. Crafted entirely from dental porcelain, a ceramic crown is the most aesthetic and natural-looking, making it the best choice for a front tooth. However, ceramic crowns are also highly durable, allowing them to be placed anywhere in the mouth. A porcelain fused to metal crown has a metal frame that is covered in dental porcelain. Extremely strong and easily able to handle the forces of biting and chewing, these crowns are a wonderful option for molars. However, we do not recommend them for front teeth, because the metal frame can show as a thin dark line at the gums. Gold alloy crowns are most often used for back teeth that need to be extra durable. They are especially desirable for those who grind their teeth, as grinding will not damage the strong gold alloy. Some people also choose gold alloy crowns for their front teeth as they like the unique look. We will discuss your options in detail to help you select the crown that is truly best for you. Regardless of your decision, we will work hard to get the details right. A good dental crown fits well, feels comfortable in the mouth, blends naturally with the rest of the teeth, and functions like a natural tooth. We are not satisfied with your new crown until you are.